In short, Professional Physical Therapists in Kansas must have a minimum 40 hours of approved continuing eduction during each 2-year cycle (2017-2018). Physical Therapist Assistants are required to have 20 hours continuing education during the same cycle. KPTA manages all CEU Provider applications and all CEU Holder (PT/PTA) storage with our partner CEU Locker. Your subscription benefits KPTA. Click the logo below. Look for this seal on any CEU course you are considering attending. This seal certifies the course meets the Kansas BoHA requirements for licensure renewal. In conjunction with the Kansas State Board of Healing Arts (KSBHA) the KPTA approves courses for continuing education credit for physical therapists and physical therapist assistants licensed in Kansas. Additionally, the KPTA provides a continuing education tracking service to Kansas licensed PTs and PTAs. The KPTA tracking service is recognized by the KSBHA in that KSBHA acknowledges KPTA provided CE reports on behalf of tracking subscribers for their license renewal CE requirements. Providers or individuals who wish to seek approval of a course, program, or activity will find the information and applications in this section. PTs/PTAs wishing to subscribe to the CE tracking service, view their CE reports, or locate pre-approved CE courses will find the information and applications in this section. Beginning in 2015, all CEU Providers (of courses) in Kansas will utilize our new CEU Locker system for making course approval applications, maintaining list of credits and submitting payments for all aspects of this process. You can get started by creating a CEU Provider account here . 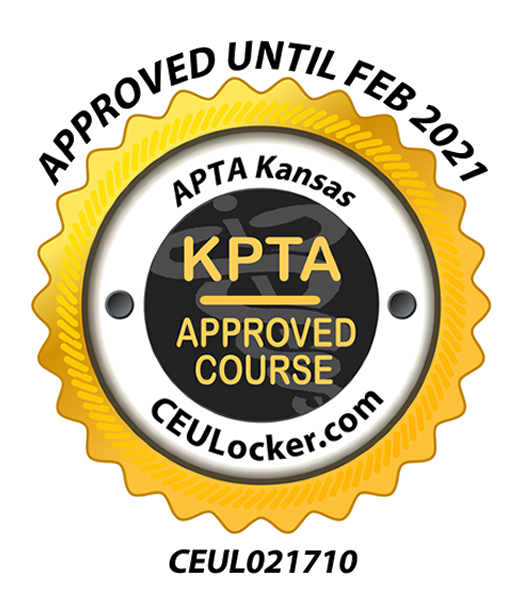 Brought to you by the KPTA, the CEU Locker provides secure, long term storage for your continuing education needs. Helping keep you organized and your practice protected, we hope you find our new system eases and streamlines the management and record-keeping required for KS state licensing requirements. You can get started in this system by creating a CEU Holder account, and paying the subscription fee on this page .